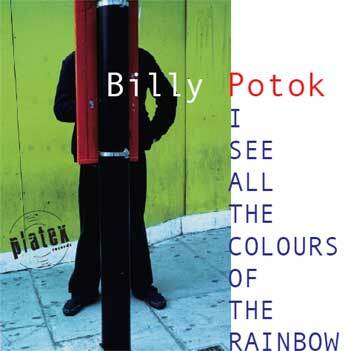 I See All The Colours Of The Rainbow’ is a song as charming and colourful as its creator, former Polish child star Billy Potok (1976). The song was originally intended as the opening tune for a rock-opera about 60’s Britpop bands, but when Billy finished the song he felt it stood proudly on its own. ‘The whole story is there in four minutes’ he said. PLATEX proudly presents ‘I See All The Colours Of The Rainbow’ as a single you can download on your computer. Billy Potok fled his native country after the gutter press discovered he was having an affair with a lady not only ten years older than he, but also married to another man. In prude catholic Poland this caused a big scandal, and Billy fell from grace. Up to then he had been a household name for some years. Billy Potok was discovered at a singing contest by manager Stanislav Brodsky – a former high ranking member of the Communist Party – and soon became lead singer with the famous boy-group Chlopcy. After seven top-ten singles in Poland, Belarus and Lithuania the group disbanded after discovering Brodski had taken all their profits to the race-track. Billy – still in his teens – went solo as a singer/songwriter and struck gold when he wrote and sang the tune for Poland’s first television soap-series ‘Dobre czasy, zle czasy’. Both song and series became big hits. That’s when Billy fell in love with Sylvia Shebreniza, the leading lady who played 16-year old Maria in ‘Dobre czasy, zle czasy’. In real life she was already 29, and when fans found out about this, it was too late. Shebreniza retired from showbizz and Billy left for England, where he settled in Blackpool. Influenced by the likes of The Kinks and The Small Faces, Billy started writing his masterwork, an opera about a songwriter’s fear of competing with his own bandmembers. This summer Billy Potok came to Groningen (The Netherlands) to visit a Dutch girl he had fallen in love with on the boat to England. He befriended The Kickers and was introduced to the owners of PLATEX. When they heard the opera’s title song they were totally lost, grasping for air at the surprise of such a great tune. And so ‘I See All The Colours Of The Rainbow’ was recorded in Groningen with local musicians. This entry was posted on August 23 2011 by ̸̬̬̦̦̖̤̾ͥTƯ͖͈̓͗̌̊ͫP̴̟͇̜̩̱̄͞ ̧͚̙͓͔̭̉̍ͭ͌̋͆̎ ̤̭̑ͧ̐F̵̢̧̹̥̹̪̲ͭƯ͖͈̓͗̌̊ͫ ̤̭̑ͧ̐Ċ͇̝̗ͤKƯ͖͈̓͗̌̊ͫP̴̟͇̜̩̱̄͞S ̆̽̆ͭ͂҉̼̝͍̜̫̜-. It was filed under archive .